Packaging Supply and Distribution Industry Barcodes labels creates barcodes stickers, roll, ribbons and tags for labeling Parcels, Luggage, Finished, Semi finished Goods and other similar packaging supply items. Packaging Supply and Distribution Industry can rely on barcode labeling software to manage their daily operations. Packaging Supply Distribution can be managed with the use of barcode technology. Barcode maker software is capable to design and generate barcode labels in major Linear and 2D barcode fonts. Generate Barcode Labels using Linear and 2d barcodes standard. Generate Barcode Labels with option to specify Barcode Value, Barcode Header and Barcode Footer. Barcode maker software provides option to specify Barcode Header and Barcode Footer. 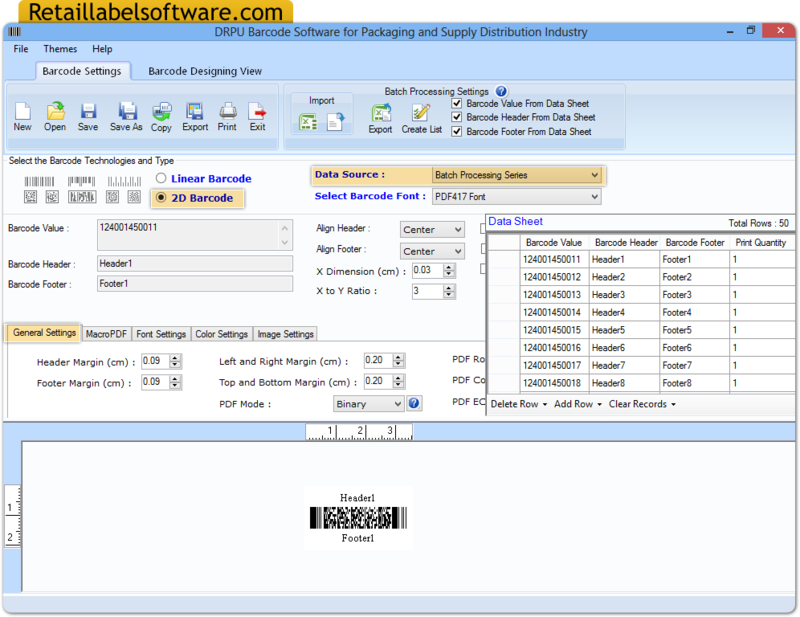 Software provides option to save Barcode labels in different file formats including JPEG, TIFF, Bitmap, PNG, WMF, EMF, EXIF and GIF. Provide option to create and print Barcode Labels with support to major barcode printers.